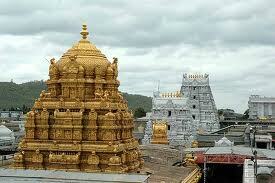 Tirumala Venkateswara temple is a Greatest Hindu temple in the hill town of Tirumala near tirupati. Located in Chittoor District of Andhra Pradesh in India. The ancient and sacred temple of ‘Sri Venkateswara’ is located on the seventh peak of Venkatachala in Seven hills. It Comprises seven peaks, representing the seven heads of adisesha, the seven peaks are called Seshadri, Neeladri, Garudadri, Anjanadri, Vrushabhadri, Narayanadri and venkatadri, the Temple is on Venkatadri hill station (also called ‘venkatachalam’) the seventh peak also known as the “Temple of Seven Hills”. This temple is the richest & highest pilgrimage center after the Sree Padmanabhaswamy Temple in Thiruvananthapuram, Kerala. The Pallavas of Kanchipuram (9th Century AD), Cholas of Tanjore (10 Century), Pandyas of Mathura and Vijayanagara pradhans (14th & 15th Century) were committed to devotees of Lord Venkateswara. After vijayanagara Empire, kings from different states, King of Mysore and Gadwal. Worshiped the lord as pilgrims and gifted various ornaments and valuables to the temple. Raghoji Bhonsle, the Maharastrian Commander, Visited to the temple, made a permanent arrangement regarding the regular pujas done to the Lord. 1843 the temple up administrative authority of venkateswara temple, 1933 the Madras Government appointed a Commission to Tirumala Tirupati Devasthanam. Through a special statutory authority to run the administration of the temple. Prasadam (Laddu), Hair Tonsuring, Hundi (Donation Pot), Thulabharam, Arjitha Seva (Paid Services). Ramanuja, Annamacharya, Tyagarajan, Tarikonda Venkamamba. Sri Kalahasthi EaswaraTemple (Kalahisthi), Srinivasa Mangapuram, Sri Govindara Raja Swami temple(Tirupati), Alamelu Mangapuram (Sri Padmavati Devi Alayam), Sri Kodanda Rama Swami Temple, Sri kapileswara Swami Temple, Sri Kalyana Venkateswara Swami emple.